IF YOU walk into a poolroom and ask 20 players what one shot gives them the most problems, I can confidently say that the straight-in shot will be mentioned more than once. But, really, what's to fear with this shot? It's a bit counterintuitive that players tremble when the angle of the shot goes from slight to nil. As we all know, though, pool is a game that has a lot to do with what's going on between your ears. Players fear a straight-in shot because it requires solid fundamentals - and it can highlight any imperfections in your stroke, stance, etc. In additional to these physical demands, straight shots also often loaded with difficulty with respects to getting position for your next shot. Because you don't have an angle, you often have to create on by cheating the pocket (shooting the object ball into the right or left side). You may also feel the need to incorporate left or right English if you want to draw the cue ball back off a rail and modify its angle. 1. Make the Object Ball. Sounds simple, right? Well, no matter what demands you're facing for position on your next shot, you need to complete this shot successfully to stay at the table. 2. Stick to Center. I really try to avoid using English on these shots because the reward is usually not worth the risk. 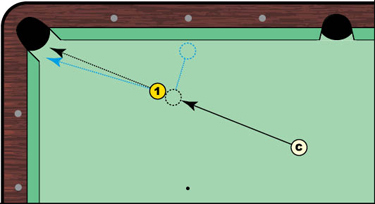 Drawing the cue ball back off a rail with English puts a lot of pressure on your stroke. Try to venture away from the vertical axis of the cue ball only when absolutely necessary. 3. Cheat the Pocket? Elite-class players know how to cheat the pocket to create an angle (see the blue arrow in Diagram 1). But be realistic with your planning for a particular shot. Can you trust your shot-making enough to put the object ball not only in the pocket, but also in a specific part of the pocket? Also be aware that the closer the object ball is to its intended pocket, the easier it is to create an angle. If you're facing a shot with the cue ball traveling three or four diamonds, cheating the pocket is not what you want to be doing.